Whatever your project, Saniflo has a solution to overcome those situations where drainage is a problem. A bath in the basement a toilet in the loft or a shower under the stairs with Saniflo the possibilities are endless! If you have any question, want to install our product, or need to find a service agent we are here to help! From the invention of the first macerator 60 years ago right up the innovation happening today, find out about The SFA group and Saniflo Australia here. With winter starting to settle in and the temperature dropping, we tend to spend extra time in the bathroom warming up, which might inspire you to make some changes and turn your bathroom into an extra cozy space. The bathroom can also be one of the coldest parts of the home in winter, so adding new pieces can definitely bring some warmth to the room. Here are some additions to improve your bathroom for the winter months. You can’t deny the appeal of a stand-alone bathtub. Its name is rather self-explanatory: a stand-alone bathtub is a tub which is not attached to a wall or a surrounding deck. This type of tub is actually reminiscent of the past when tubs were used as a movable basin and today, they are once again popular. Besides being eye-catching and having a stylish appearance, they create an illusion of space, which can add a modern look to your room. They can also be moved or replaced easily without major changes, which is not the case for regular tubs where the wall where your tub was installed has to be repainted. Additionally, freestanding bathtubs are easier to clean and maintain due to the absence of grout lines. Aside from the practical aspects, standalone bathtubs exude a sense of luxury and relaxation, perfect for your bathroom. If you want to install a stand-alone bathtub anywhere in your home, a Saniflo product like the Sanivite can make this happen. Saniflo’s Sanivite is a small grey water pump with the ability to pump wastewater 50m horizontally and 5m vertically back to the sewerage, meaning your standalone bathtub can be installed anywhere in the home. This is especially useful if you are hoping to create your standalone bathtub in an area that is not easily accessed by existing plumbing. What would be better than coming home from a long and cold winter day to a nice hot, steam shower? By simply pushing a button in the shower, you are able to unwind and enjoy a soothing and relaxing cloud of steam. A few minutes of steam later and you leave feeling like a new person! Steam showers offer the typical options of a regular bathroom shower, with the added benefit of the steam feature. Since day spa-inspired bathrooms are becoming more and more popular, adding a steam shower can also add to the overall value of your home. 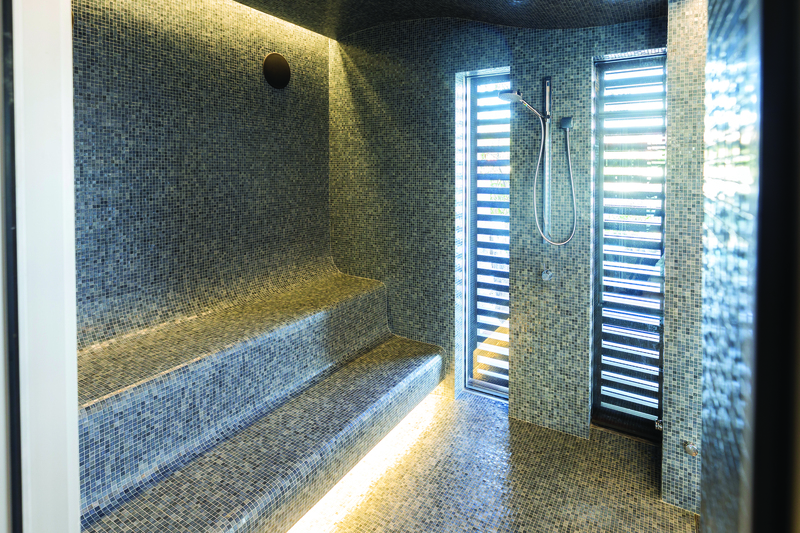 Besides having benefits of increased blood circulation and improved skin health, steam showers are known to be relaxing. If you are stressed or you struggle to sleep at night, using a steam shower before going to bed can be extremely effective on the body. In order to install a walk-in steam shower and create your relaxing bathroom haven anywhere, consider using Saniflo’s Sanifloor. The is a compact greywater suction pump that can be easily connected to a shower up to 30m horizontally or 4m vertically to the sewerage mains.